Bread pudding made from cake donuts! Baked with a coffee custard, and topped with a coffee glaze! 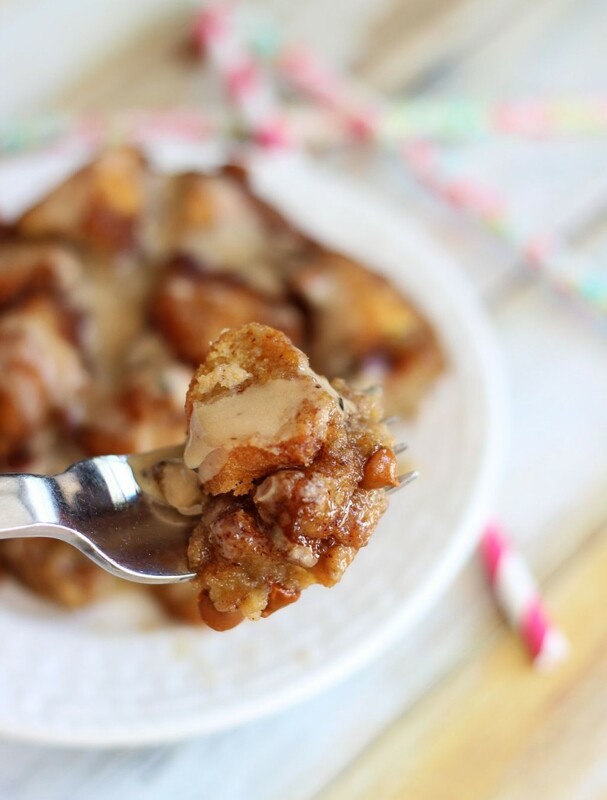 I’ve wanted to make a donut bread pudding for, well, forever. As a donut-obsessed person, this concept always held so much appeal to me. Since I’ve finally done it now, and it was a smashing success (if I do say so), now I want to make bread pudding out of every other bread product I can think of. I’ve always wanted to do this with croissants too. I’m doin’ it. Soon. How can that NOT be good? It can’t. Or… bagels. I think that could even work. What else? I’m going to keep brainstorming potential bread pudding candidates. If one thing’s for certain, I will fixate until I feel my brainstorming and experimenting has been thorough! I won’t be able to help myself. How is it possible to take donuts, a food that is already so perfect and difficult to improve upon, and make them even more decadent, less healthy, and overall better. That’s a tall order. We’re talking about donuts. They’re already soooooo sooooo SOOOOO ridiculously good. Even the plain cake donuts are pretty killer. I’ve yet to meet a donut that I didn’t like though. Still, it is apparently possible to elevate them to another level = bread pudding. Ahhh, bread pudding. A dessert that sounds dull and boring, and looks unassuming, but is altogether fabulous. Carbs baked into custard. What’s not to like? But donuts call for coffee. Everything calls for coffee in my world, but especially donuts. Right? 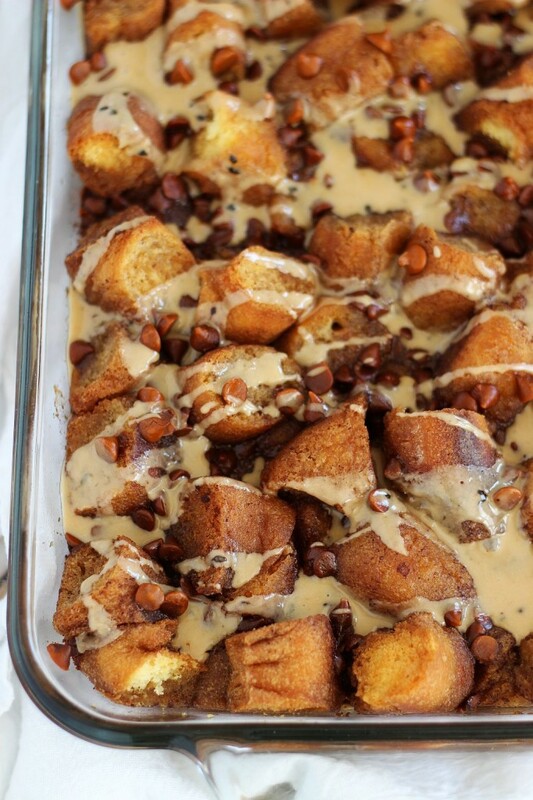 Thus, the custard component of this bread pudding is, you guessed it: coffee-flavored! It’s just good sense. Coffee and donuts belong together. I was also sort of inspired by my S.O.’s habit of dunking donuts in coffee. I know that this is a common practice, it’s just not something I do myself. I’ve never been much of a dunker. Whether I’m drinking milk or coffee, I just don’t really want anything else in it. Even donuts. He does it with everything though. Donuts, chocolate chip cookies, brownies. Any sweets and pastries. I don’t know about all that, but I think I can get on board with donuts. 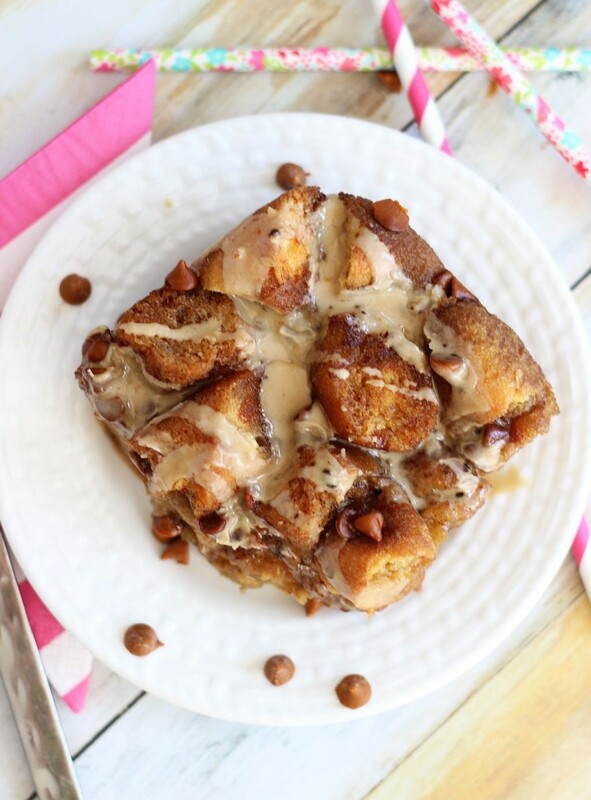 And if I’m making a bread pudding out of donuts, then I definitely want there to be coffee. It’s in the custard, and it’s in the glaze. There’s plenty of coffee here. 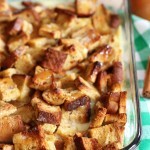 There’s also a slew of cinnamon and cinnamon chips in this bread pudding. You know, for good measure. Lightly grease a 2-quart baking dish with non-stick spray. Layer the donut pieces in the dish. 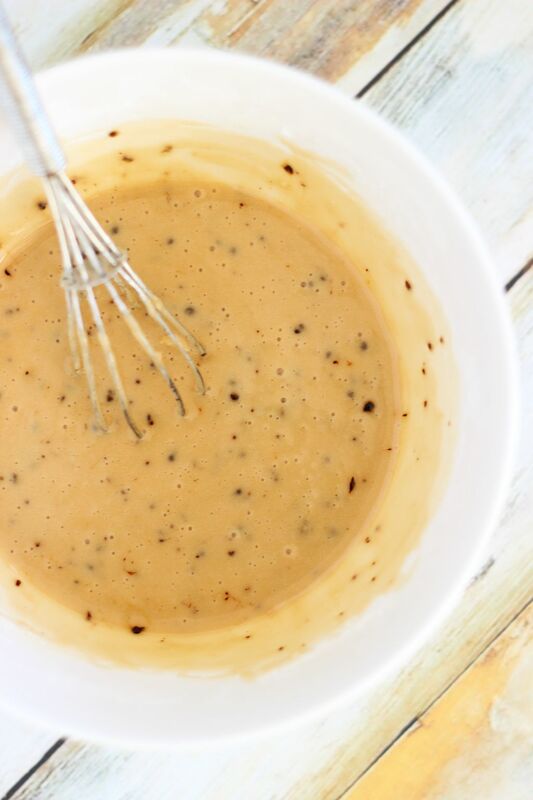 In a large bowl, combine butter, sugar, eggs, milk, coffee, cinnamon, and vanilla. Whisk until well-blended. Sprinkle the cinnamon chips evenly over the donuts. Cover the dish with foil, and bake at 350 degrees for 30 minutes. 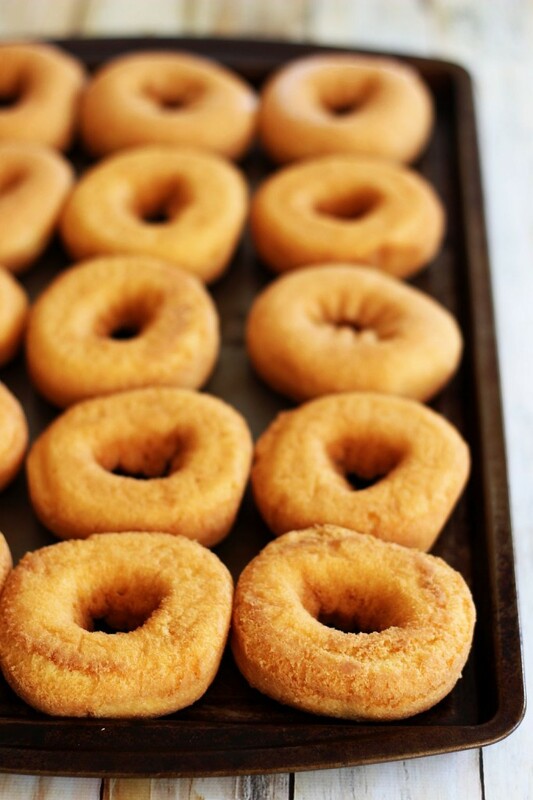 Remove foil, and bake for another 10-15 minutes, or until custard is set and edges of the donuts are golden brown. In a small bowl, combine coffee, instant coffee, and powdered sugar. Whisk until smooth. Drizzle over bread pudding while it's still warm. If donuts are not already stale, bake them on an ungreased baking sheet at 350 degrees for about 12-15 minutes, or until edges are golden brown. That looks like the dessert of my husband’s dreams Sarah! Donuts, coffee and bread pudding are 3 of his favourite things. Pretty sure I’m going to have to make this for him! What a creative recipe! Love it! Yay!!! So glad it’s a winner. Let me know if you try it! SOOO can I sub this in as my morning cup of coffee?! 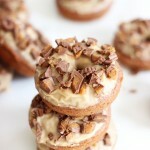 I am IN LUHVE with the idea of cake donuts to make bread pudding. Totally craving and drooling over here! Pinned! Oh wow, this looks incredible, Sarah! I am so loving your donut bread pudding. This sounds fantastic! I wish I had this for breakfast right now, would definitely make my Tuesday better! I wish I had some left!!! It would definitely make this dreary Tuesday better! Thanks, Gayle! This looks fantastic! I am a huge fan of coffee and donuts so this bread pudding doesn’t stand a chance. I will devour the entire pan. Lol! I know how you feel. That happens a lot in my house! Haha! Thanks, Jen! Love this combinations – sounds amazing! This is pretty much like the best idea ever! 🙂 Love this, Sarah! Thanks, Carrie!! It’s something I’d been wanting to try forever! You didn’t. Coffee + donuts + bread pudding = totally unreal. I need to go make supper so that I don’t end up making and eating a WHOLE PAN of this! Oh my gosh. This is genius! Lol! Thanks so much! So glad you like it! Oh, lord. You won’t mind if I just steal that whole pan outta my screen and just sneak off with it will you?! This pudding looks UNREAL, Sarah! I mean, we’ve got coffee and donuts so this qualifies as breakfast right?! Right??? World’s best breakfast!!! Haha! Carbs + caffeine, ftw! looks delicious! Last week, for a potluck I made blueberry croissant bread pudding. Everyone loved it and there wasn’t a crumb left! I am going to try this recipe as well. That’s such a great idea! I’ve been wanting to try bread pudding with croissants, but blueberry didn’t occur to me, and that sounds amazing!!! Obsessing over this right now. That’s all I have to say. 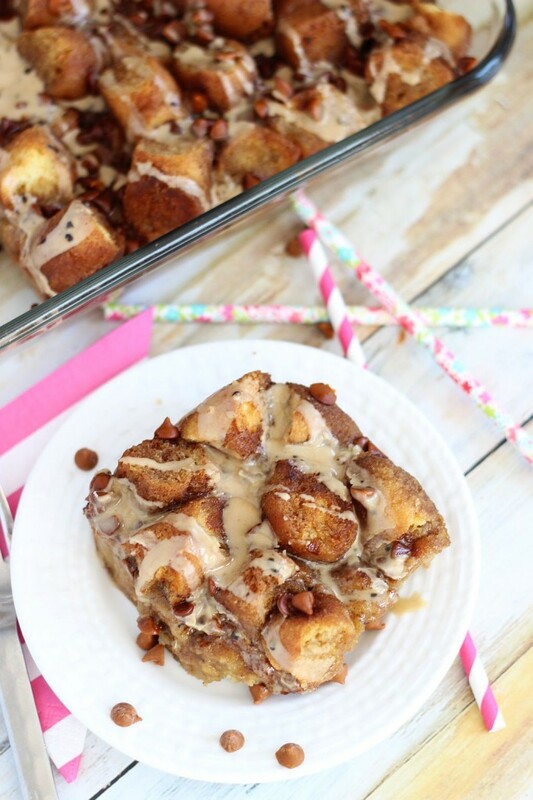 I didn’t think I could love donuts anymore but donut bread pudding??? Girl, that is brilliant! I just want to plant my face in the entire pan! It looks craaaazy good! I always thought bread pudding was pretty boring and bleh. I bet it’s amazing when made with donuts!! I know what you mean! 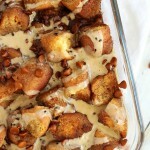 Bread pudding isn’t exactly a very trendy dessert, but I think it can be awesome when it’s jazzed up! We loved this version! Speechless. And hungry. OMG this looks amazing! This will HAVE to make an appearance in my kitchen! What a great idea! Oh my gosh! This looks so good, it makes me WANT to have company over in the morning! Thanks so much for linking up to the Oh My Heartsie Girls Wordless Wednesday! I hope we see you again next week! This looks amazing and I bet it smells just as good as it looks! Thank you so much for linking up the recipe at This Is How We Roll Thursday. Oh yes, please!!! I’m literally drooling right now. This looks sooooo good. And using donuts is genius!! I usually use cinnamon raisin bread but this is wayyyyy better!! Lol! Thanks, Kristin! We loved it. The donuts were such a nice spin! I am not a big bread pudding fan, but my husband is. I might like it because of the doughnuts. I have to give this one a try. You’re right – you DID find a way to make donuts better! And that glaze looks so divine I could eat it all by itself! Haha!! Thank you, Mary! 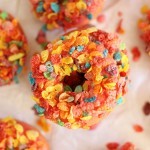 I didn’t think donuts could get any better, but there may be other ways too, and I’m determined to find them out!! 🙂 Lol. Thanks for your kind comment! I’ve never had bread pudding… donuts? Oh yeah I love those. 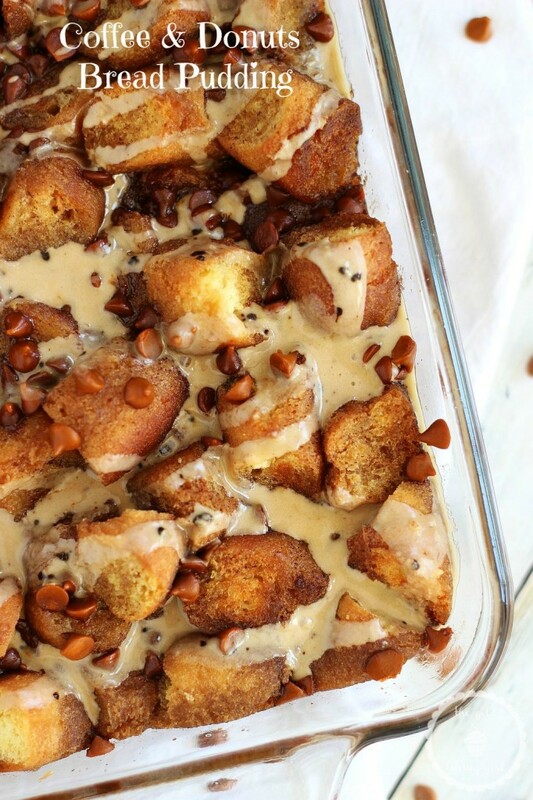 So this recipe is tempting me to make my first batch of bread pudding. Coffee???? For real? L.o.v.e. it all! 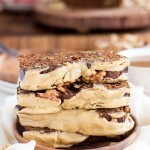 Thanks for linking up this luscious recipe at our Pure Blog Love Linky Party! I’m excited to see what you’ve been doing this week. Never had bread pudding?? You must! It sounds boring, but it’s not – it’s amazing. Start with this donut one because it is wonderful! Thank you for the party! Found you thru The Thurs This is How We Roll Party when I linked…I am loving your blog…this recipe in particular is awesome! I followed on FB and sub bc I Do Not Want To Miss Thing!! Thanks so much, Chris! So glad you like the recipe! Americans often confuse bread pudding with bread and butter pudding, but they are not the same thing. Bread and Butter Pudding if made correctly is, slices of buttered fresh bread, baked in an egg custard and flavoured with various other things. It should not be dry or contain more bread than custard. Whereas, Bread pudding is more of a moist cake made from leftover stale bread that is soaked to make moist again mixed with eggs, various dried fruit, sugar, spices, butter and milk. I made this tonight but left out the extra sugar and only used 8 doughnuts ( 3 of them were raspberry filled) with the amount of liquid ingredients the recipe called for. I added about a teaspoon of fresh grated nutmeg and a splash of bourbon. It turned out perfectly, not too sweet, with the extra kick of the bourbon. I also did not add the glaze to skip the extra sugar. I let the doughnut pieces soak in the custard for about 20 minutes prior to baking since they were very stale. 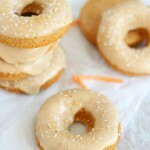 Great use for leftover doughnuts. I might make this for Christmas. That’s wonderful! I’m so glad you liked it, and that it turned out well for you! Thank you so much for sharing your feedback and the changes you made! Adding raspberry-filled donuts to this sounds AMAZING. Could you make this the night before and let it soak in the refrigerator overnight, then bake the next morning? Most bread puddings can be made the night before to soak overnight, but I wouldn’t with this one! Donuts are just softer and more porous than some other heartier breads that get used in bread puddings, so I think it could end up making them too soggy! I hope that helps!